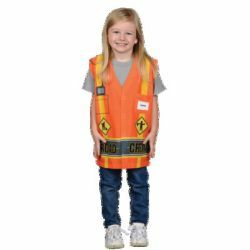 Kids look cool and comfortable with this realistic orange vest that can be spotted down the hall or around the block! Details include printed yellow road stripes, construction logos and cell phone graphic peeking out of a breast pocket. The bottom of the vest is adorned with the phrase “ROAD CREW” in large capital letters. Pocket on chest for personalization. Ages 3-6.